The weekend of December 3-4, 2010, will be a special one for residents and visitors to Black Mountain, the closest town to the Inn on Mill Creek (approximately 10 minutes west). First, on Friday, December 3, the annual Holly Jolly celebration takes place, including street festivities and a chance to do some Christmas shopping at the local stores, which will be open late. One of the things we love about Black Mountain are all of the unique local shops and galleries packed into a charming small town. 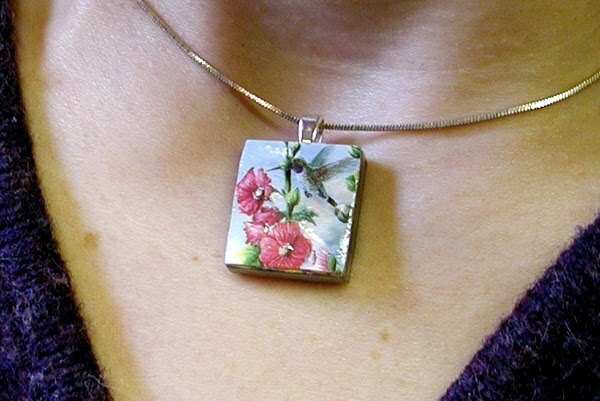 A lot of the shops, including one of our favorites, Art from the Heart, carry handmade items from local artists and craftspeople, such as this awesome hummingbird pendant fashioned from none other than a scrabble tile. On Saturday, December 4, Santa will be available for photos ($10) at the Black Mountain-Swannanoa Chamber/Visitor Center from 10am-3pm. Refreshments will be served. Then, the Black Mountain Christmas parade, with over 100 entries, will be making its way through downtown at 4pm, followed by the annual Circle of Lights at Lake Tomahawk Park from 5pm-7pm. Circle of Lights is a free community celebration featuring 350 luminaries, live music, refreshments and a bonfire. This entry was posted in Uncategorized and tagged Black Mountain, festivals and special events, shopping by Inn on Mill Creek. Bookmark the permalink.